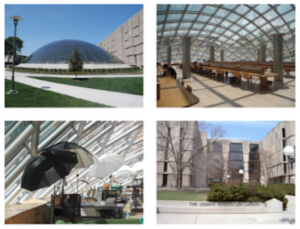 The Joe + Rika Mansueto Library (Helmut Jahn, Murphy / Jahn, 2011) at the University of Chicago is very much the opposite of its older neighbor, the Joseph Regenstein Library (Skidmore Owings and Merill / Walter Netsch, 1970). The Regenstein is a forbidding citadel enclosed by an array of large squarish chunks of astonishingly lifeless, gray limestone and hung in place so regularly and without reference to context as to deny the comforting and natural distinctions between up and down, top and bottom, right and left, north and south, east and west. It succeeds, by means of its solidity, in distinguishing inside and out. There are tinted glass bays in the center bay of the structure, but other than that, glass and daylight are relegated to the narrow interstices between chunks. It is an essay in not knowing that the exterior of a building can serve its interior and the people inside. As point of reference, Louis I. Kahn’s Philips Exeter Library opened in 1971 and serves as an interesting comparison as the buildings are contemporaneous and that, at Philips Exeter, the challenges of daylighting, up and down, inside and out, are addressed in an integrated and coherent way. The Mansueto, whose appearance is quite different from the Regenstein is similarly single-minded in its approach to daylight: it admits nearly all of the available light and reveals its interior completely. Ultimately, one asks the question as to whether it serves its inhabitants much better. An egg-shaped network of steel holds panels of fritted glass in place. This envelope admits virtually all of the light that falls on it and into the staff and study areas directly below it. It is much too bright, at least on sunny, summer afternoons and it may be the same under skies of thin overcast. In full sun, the interior sizzles, visually bordering on glare at the front desk and study tables. Several staff tables on the northwest side are protected by umbrellas and while these protected work stations are apparently for preservation work, if that work were moved elsewhere (as maybe it should be) I’d keep the umbrellas in place. More would be helpful. I visited on a warm, July afternoon and although cool, conditioned air was fervently pumped inside, I could still feel the heat battling back against the a.c. Needless to say, the books are stored below this level, a projected 3.5 million of them in a deep multi-level, automated retail storage and retrieval system not intended for lengthy inhabitation. This below-grade area requires little or no light. It seems that you have a choice of either too much light or none. So much for browsing. It would be worth visiting the library under different sky conditions. My guess is that under light overcast skies, it would still be a substantially bright space; overcast skies can be very bright, brighter than a clear blue sky across the entire sky dome, and this can be a visual problem. On sunny winter days, the glare might be worsened as it may be easier for low angle sunlight to enter into a visitor’s cone of vision and to skim the reflective surfaces of reading tables and materials. A reading space begs for surfaces that reflect and diffuse light into a space and for lighting variety so that readers can find different locations that suit them, individually, and give the eyes a rest from a uniformly lighted field. It might also be interesting to see this space at night; the library probably looks great from the outside with its electric light blazing. The Mansueto is an elegant modern structure, a nice object on this corner site, but a pat answer to the idea of a library as place to care for books and to read. Here, the books are hidden and its readers entirely exposed to sun and skylight. I suppose that students can retreat to the old Regenstein and total electricity. Mansueto’s lighting design wins a GE Edison Award of Merit. American Institute of Architects’ Chicago Chapter Awards the Mansueto Library a Distinguished Building Citation of Merit.